Allow me, Gentle Reader, to digress and tell you something about the Dwarves of Trollworld. Of all Kindreds, Trolls dislike Dwarves the most. This is because Dwarves compete with us for the buried riches of the planet. You, Gentle Reader, probably think that Dwarves are just short sturdy humans. Read this report and learn just how wrong you are. Sturdy, stalwart, and stupid--that what you get when you're carved rom rock and have brains made of stone. The Dwarves of Trollworld are the people of Gristlegrim. They are a sturdy race–larger than Hobbs and Goblins, smaller than Men and Elves. They are generally not considered to be beautiful–being too broad and somewhat asymmetrical–but their faces have great character and integrity, and their bodies and minds are strong. Gristlegrim made them–literally carved them out of stone, then used a powerful version of the Living Stone spell to bring them to life. He did it because he noticed that all the other great wizards of Trollworld had subject races to use in their wars against each other. People freshly carved out of stone have but little in the way of mind or memory. After verifying that he could indeed bring stony statues to life, but then finding that they simply sat around and watched him unless he magically seized their minds and used them as living puppets, the Dwarf God saw that it takes more than bodies to make a people. He set his first few dozen Dwarves to simple tasks, carving a tunnel into a mountain, and went off by himself to study the situation. From time to time he sent them food. Because they were living creatures they needed living food, but he wasn’t too interested in feeding them, so he only sent a kind of moss and lichen stew–rich in vitamins and minerals. To this day, Dwarves still love to chomp on scummy mossy things that other races wouldn’t even consider as food. It explains why moss is so often seen in their beards–they are messy eaters. Scrying the multiverse, Gristlegrim found another race of Dwarves somewhat like his own on the world of Midgard (sometimes known as Earth). These ancient creatures (the maggots of Ymir) were accomplished stoneworkers, mages, fighters, and traders. Gristlegrim admired their industry and decided to mold his new minions in their likeness, but how to do so? He came up with a simple plan–he abducted a few dozen Dwarves from Midgard, brought them to Trollworld, and told them he wouldn’t send them back until they had taught his Dwarves all they needed to know to survive on their own. Imagine being abducted from your own world by some sort of mad deity, and told to perform a hopeless task before you would be allowed to return. Those kidnapped Dwarves didn’t like the idea much, but when one of them tried to physically attack Gristlegrim, he was exploded like a blood sausage, and when a mage tried a magical attack, Gristlegrim turned his head inside out while leaving him still alive. Sickened and terrified, the remaining captives agreed to teach Gristlegrim’s Dwarves how to live. Laughing hugely, Gris then reversed his spells, restoring both Dwarves to life and health, and set them free. Getting a couple of stone-masons from Midgard to help him, Gristlegrim went back to carving Dwarven statues. But, they were all male–as Gristlegrim was a man, and hadn’t associated with women for millenia. However, one of the Midgardian masons liked women, and he began carving some female, beardless, and quite voluptuous statues, and thus the khzd race came to include both sexes. To aid in bringing multitudes of statues to life at once, each new Dwarf was carved with a G rune hidden somewhere on its body. A favorite spot was the bottom of the chin, another was the soles of the feet. All Trollworld Dwarves have a G rune that looks like a tatoo somewhere on their person–without it they could not live. The Dwarves from Midgard found that they did not age and die on Trollworld as swiftly as they had on Midgard. It took centuries, but they trained and educated Gristlegrim’s Dwarves into fair replicas of themselves. They learned stone-carving and metal-smithing, and architecture, and combat, and wizardry. Not many of the carven Dwarves seemed to have any natural talent for magic, but a few, perhaps one percent, those whose raw ore had contained some silver, seemed to be potent magicians. Something about the silver seemed to allow the natural magical power of the planet to infuse them to a greater degree than their fellows. It took about 2000 years, but finally Gristlegrim had what he wanted; namely, a race of tens of thousands of strong, sturdy, and fearless fighters with some magical talent. They thrived in great subterranean fortresses, meeting and beating Uruks and Trolls on their own ground. They were manlike enough to pass among humans without arousing much alarm or suspicion. He scattered them around the world on all continents, and they have been ubiquitous ever since. And he returned his teaching cadre to Midgard, where time seemed to pass slower than it did on Trollworld. 2000 years in the other world was a mere 400 years on Earth. They came back with riches and magical power beyond belief, and many of them became legendary Dwarven kings and rulers. There are some definite oddities about the Dwarves of Trollworld. Standing from one-half to two-thirds average human stature, they have no children among them. That is because new Dwarves are still made by carving a figure from stone, complete with a G rune which is the last thing to be added, and then magically brought to life. It takes from twenty to fifty years to infuse the blank Dwarf with knowledge and personality, and during that “growing period”, it is kept as a laborer in the deepest Dwarven caverns. Dwarves generally speak three languages: the Root Tongue which is Gristlegrim’s native language brought from a vanished world. It is notable because it has no vowels in it at all. The original Dwarven people were called “khzd”, now pronounced as Kah-zahd in Dwarvish which is the root tongue with vowels added. All Dwarves also learn the Common Tongue of Men, as it is the most widely spoken language on the planet. Because of their origin as statues, Dwarves rarely change size or weight. Dwarves can eat as much as they want and never get fat; conversely, if they were carved fat to begin with, they can starve themselves and never get thin. Dwarves have neither fingernails nor toenails, but both fingers and toes are broad, spatulate, and strong. They have only one kind of teeth, squarish molars good for grinding away the roughest plants. A Dwarvish smile is a frigtening thing. If a Dwarf was carved hairy, then it is exceedingly hairy when it comes to life. If carved bald, then it never grows hair at all. Because they all started as stone, and retain a certain implicit rockiness (although they are not the true living stone of Trolls), Dwarves have exceptional strength and constitutions. Gristlegrim wanted them to be strong and hard to kill in order to fight the Uruks and Trolls who share their environment. Dwarven senses are magically keen. They can see well in conditions with very little light; their hearing is acute; and it is said that they can smell gold or other metals. They are quite sensitive to vibrations, especially vibrations in rock. They do not seem to feel pain and pleasure in the same way that humans do, experiencing both as just varieties of pressure which rarely bothers them. Because of this immunity to pain, they can fight on with terrible wounds that would leave other life-forms gasping in agony. Dwarves seldom mention how things taste, except to comment on various mineral flavors. They love alcoholic beverages, but it takes a great deal to intoxicate them. The great majority of Dwarves never leave their cavern strongholds. Only a relative few go forth to live and adventure in the outer world, and this they do as a form of service to their people. Dwarves need traders to bring foods and cloth and other luxuries to their underground cities. Whatever can be made from rock or metal, they can make, but organic goods are harder for them to obtain. They also need knowledge. They are excellent craftsmen and tireless workers and searchers, but there are few Dwarven inventors or innovators. Luckily, for the reputation of the Dwarves as master technologists, they have strong alliances with the Gnomes, and all Gnomes are full of wacky ideas. Sometimes the Dwarves can actually make some Gnomish flight of fancy work, and when that happens there is a technological advance. Although the Dwarves who venture to the surface appear to be a bluff, good-hearted, friendly people, their rulers and masters in the caverns are secretive, suspicious, and greedy. They never allow outsiders to penetrate into the true Dwarven fortresses–going so far as to construct whole mock-cities on upper levels where surface dwellers can be suitably entertained and impressed. A showpiece city can be extensive and beautiful, but it always seem to be sparsely populated, leading outsiders to believe that Dwarves are not a numerous race. Nothing could be farther from the truth. Half a mile deeper in the Earth lies the true Dwarf metropolis with untold thousands of inhabitants performing their countless jobs: mining, smelting, building, tunneling, creating weapons, tending the vast fungi farms that provide their basic food. New Dwarves are carved at the very deepest levels–miles below the surface, and they wait in uncounted millions to be released into life. Meanwhile, the Dwarven population increases slowly but steadily, and the outside world never knows. Dwarves have only one truly natural enemy–the great stone Trolls of Trollworld. Only those Trolls can penetrate into the deepest Dwarven cities, and Dwarves, being of rocky origin to begin with, are considered a great delicacy by the Trolls. To them, Dwarves taste better than anything. The Trolls also resent the fact that the Dwarves are carving ever bigger and deeper caverns, turning living rock into unliving metal, and driving them from their ancient haunts and homes. Deep under the earth there is a never-ending war between Dwarves and Trolls, with raw power and savagery going to the Trolls, but numbers, organization, and planning going to the Dwarves. Ever so slowly, the Trolls are losing this war also. Dwarves encountered on the surface of Trollworld are generally good fellows–stout, axe-swinging maniacs, and the best dungeon-delving bodies you could ever ask for. Dwarves are good at making alliances. At one time or another they have allied themselves with Humans, Elves, Uruks, Goblins, Ogres, and even Dragons. They have never allied themselves with Rock Trolls. Trolls consider them to be little better than smart food. Dwarves are the most insidious threat to every other sapient kindred on Trollworld. According to their prophecies, some day the Dwarves will rule over all. 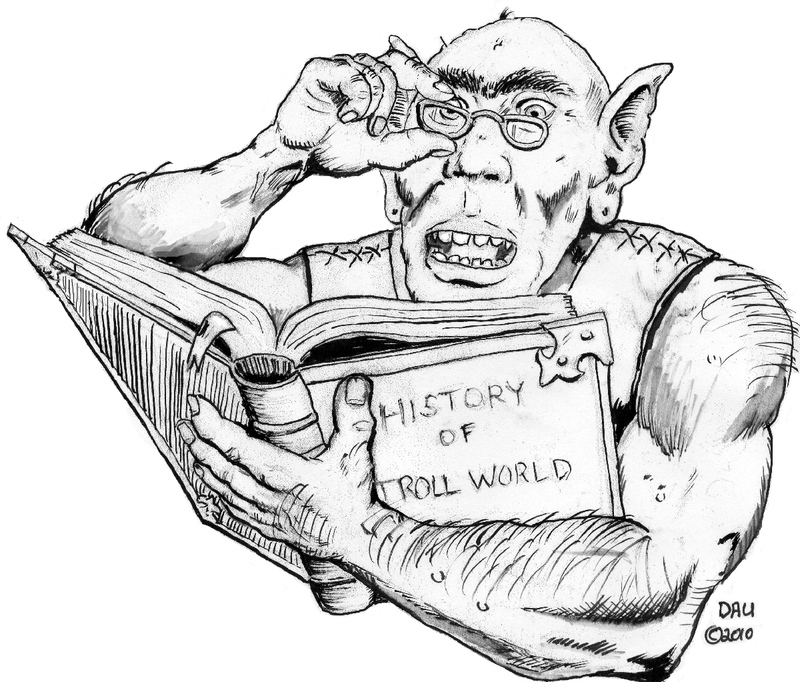 As I re-examined this chronology of Trollworld, which has existed in one form or another for more than a decade now, it occurred to me that I could integrate it with other bits of Trollworld lore that have been created–hence this short essay on the history of Dwarves. Although other forms of this chronology exist in various rulebooks, and on the web, this latest revision supersedes them all. Things may be changed and added here that have never been seen before. Trollworld continues to evolve in my mind. The fne picture of a Dwarvish warrior was created by my friend Garen Ewing some eight years ago, and it has not been seen for quite a while. Perhaps I will show other art pieces contributed by my friends in bygone days. I certainly will if I can find them. As a player of T&T Dwarves this is the greatest find possible. How wonderfully detailed and such flowing words. My I copy it to my web/Blog? All credit will be given to the TrollGod. JS I am not.